There needs to be a detailed plan and the funding to keep the narrow land link between Nova Scotia and New Brunswick open, say scientists and residents in the Amherst area. 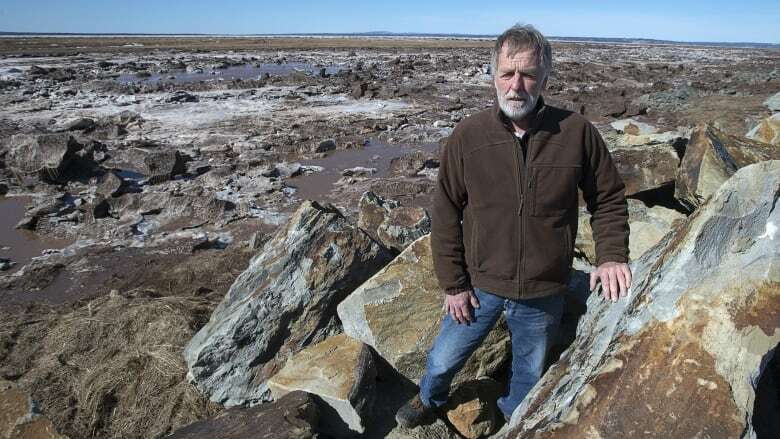 John Atkinson stands atop an aging dike, with the rising tides of the Bay of Fundy before him and family farmland behind, imagining the storm that could turn Nova Scotia into a virtual island. "The water can go over this whole flat marsh," said the 67-year-old landowner, gesturing to the grassy lands near Amherst. "If there were to be one perfect storm ... it would be very bad." 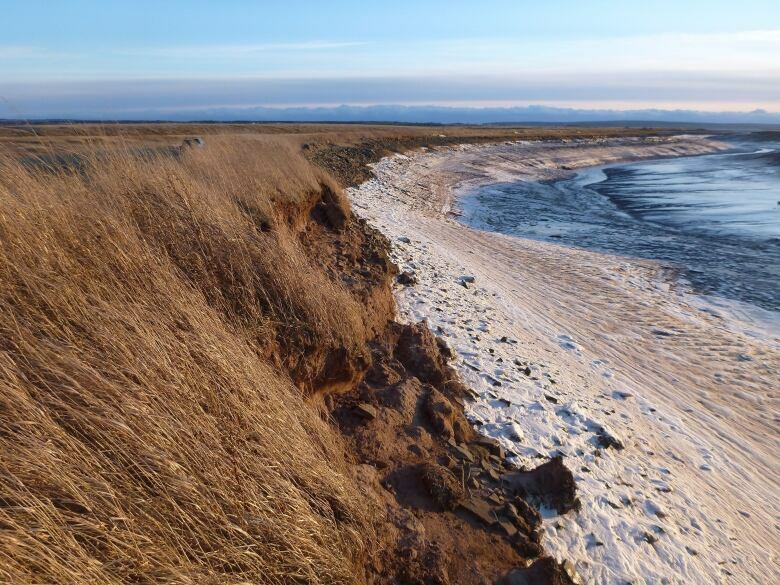 This is a potential ground zero of a Canadian climate change disaster, where sea-level communities face rising oceans and await word on a detailed plan and the funding to keep the narrow land link between Nova Scotia and New Brunswick open. The risk isn't decades away. Rather, the event could occur at any time through a combination of stormy weather conditions, according to emergency officials and coastal geographers watching the area. 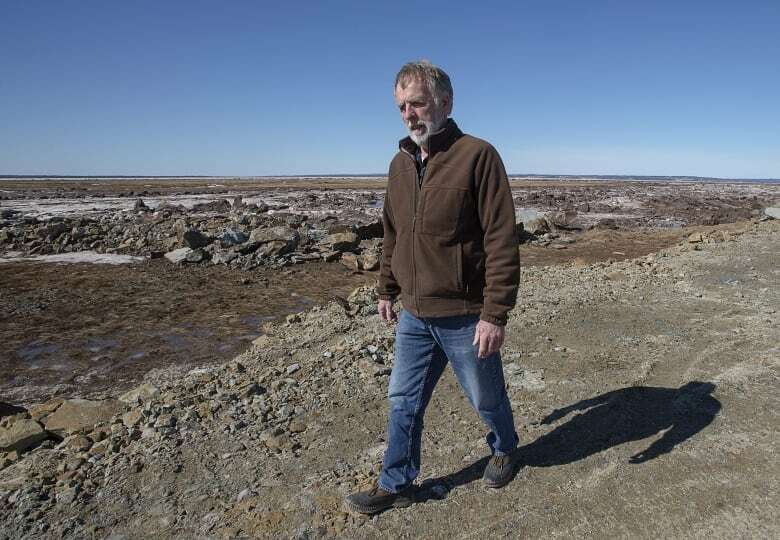 "The fact is that the right storm occurring at any spring tide at any time of year would be sufficient to put water over our dikes," explains Jeff Ollerhead, who teaches coastal geography at Mount Allison University in nearby Sackville, N.B. Over the past 69 years, the sea level at the mouth of the Bay of Fundy has risen about 38 centimetres, even as the dikes and coastal land continue to subside. The trend will accelerate under most international climate change scenarios, adding a third of a metre to water heights by 2050, according to studies. Meanwhile, the frequency of hurricanes and tropical storms has tripled here over the past 25 years compared to the past century, according to a 2011 study. Real Daigle, a meteorologist who provides estimates of sea level rise, said all it would take is a once-in-50-year storm at highest tides, with sustained winds gusting up to 80 kilometres per hour and low atmospheric pressure that adds 40 to 50 centimetres to the height of the water. The one comfort is that the rapid pace of the Bay of Fundy tidal rise and retreat — versus areas like the Northumberland Strait, where tide rises are more gradual and sustained — would make the storm's arrival at the high tide in the basin an unlikely event, he adds. Saint Mary's University geographer Danika van Proosdij's research unit prepared maps for The Canadian Press showing risk zones that extend into Amherst itself, floods of businesses and wind turbines on the marshes, and potential damage to 20 kilometres of rail, road and electrical infrastructure. 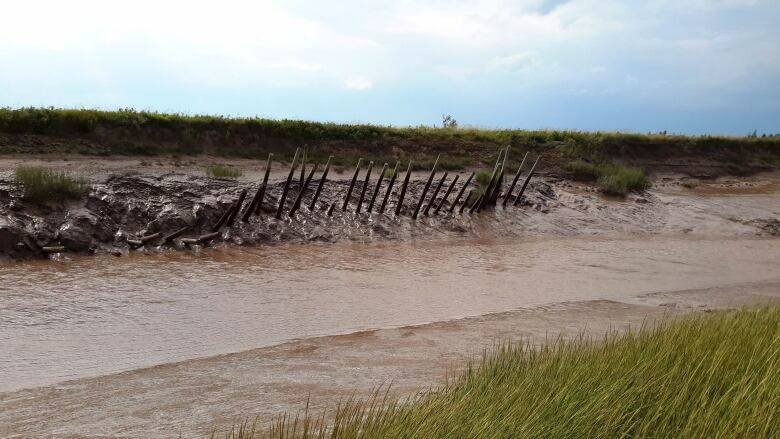 The waters could sweep over the Trans-Canada Highway in lower lying New Brunswick, reaching a waist-deep height for motorists, said Mike Johnson, emergency measures co-ordinator for Cumberland County, Nova Scotia's westernmost region. He says he's planning to knock on doors and collect cell phone numbers of about 80 buildings where rapid evacuation may need to occur. "We've had two tidal surge events in the past decade that would have been sufficient to overtop the dikes. They simply occurred on a neap (lower) tide and because of that factor the water didn't come high enough to overtop the dikes," he said in an interview at his office. A photo he took in the fall of 2015 shows a CN rail train travelling on a dike that is about 8.5 metres above sea level during a tidal surge. The water was just 12 centimetres from the train's wheels. 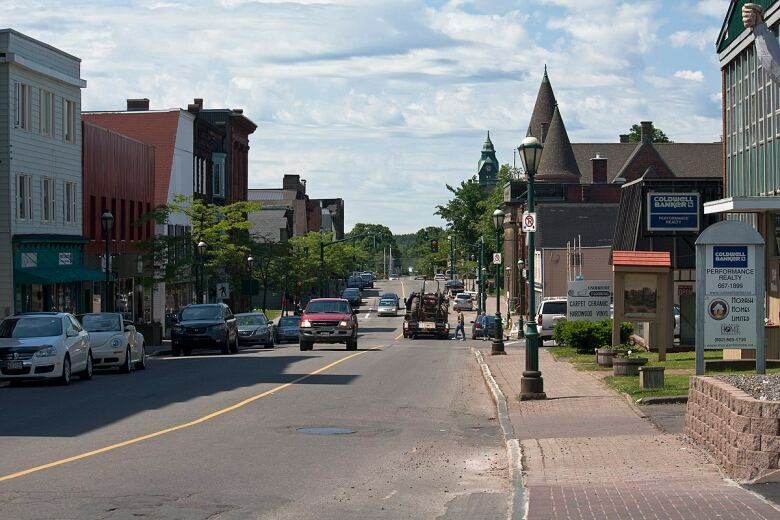 Amherst Mayor David Kogon and John Higham, the mayor of Sackville, N.B., are pressing federal and provincial governments to quickly find solutions. "Our job is to keep their foot to the pedal," says Kogon, sitting before a large poster depicting a partially submerged Sackville. "If I were in charge of it, it would be underway now. But we're not, it's not our money," says Higham, who joined his Nova Scotia counterpart for an interview at his city hall. Higham's town is also protected by a network of about 26 kilometres of dikes created to protect farmlands, but which now shelter commercial areas and homes. His flood map depicts a provincial ambulance depot as stranded on an island after the inundation comes. If the dikes are brought to new heights and repositioned to resist the rising seas, it wouldn't be the first time the marshlands were rescued by a combined political effort. In the 1940s, Ottawa created a federal agency that helped fund the rehabilitation of the marshlands. However, the responsibility shifted to provinces in the 1970s, and there have been times over the past 50 years when money has been scarce for needed upgrades, say local farmers. Doug Bacon, a cattle farmer in Upper Nappan, says he spent years fighting for improved aboiteaux — openings in the dikes with sluice gates that allow fresh waters to drain out back to the sea. His home is full of photos of freshwater floods that came over nearby coastal roads and the grazing marshlands over the past two decades, as aging infrastructure was unable to cope with the flow of water. He said Canadian governments should have led a plan for the dike rehabilitation at least a decade ago. "The provincial and federal governments seem very slow to recognize the concerns that we as residents are trying to portray to them," he said during an interview. The potential costs and next steps remain as murky to Bacon as the often muddy waters of the Bay of Fundy itself. 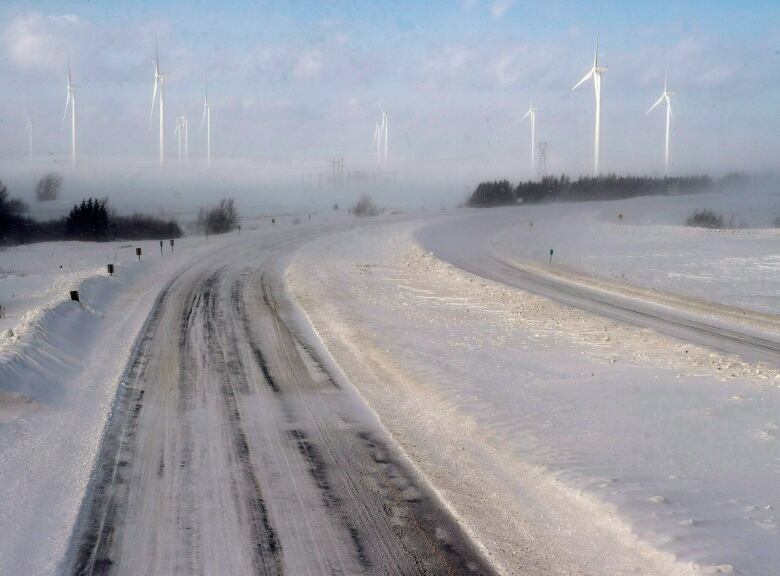 Hopes are now pinned on an engineering assessment that New Brunswick, Nova Scotia and Ottawa say will "explore viable options to climate change impacts on the Chignecto Isthmus trade corridor" between the two provinces. Kevin Bekkers, land protection manager at the Nova Scotia Department of Agriculture, says a request for proposals to complete the $700,000 study will go out after April 1, with the goal of completion in 12 to 18 months. "Fast is not the pace I want to go as an engineer. There's things we need to confirm and this engineering assessment is one of those steps along the journey that has to take place," he said in an interview. The issues include comparisons of various climate change forecasts and what new technologies are available to increase the height of existing dikes, he said. Even the timeline for how long the solution should last remains uncertain, he said. After options are presented, the governments must agree on the way forward and how much they will spend. A 2016 federal study said possibilities ranged from $90 million to build up the existing dikes to $345 million to completely reroute the highways and railways. All of the options required at least five years. Mike Pauley, the New Brunswick civil servant leading the engineering assessment, said he can't flatly state the study of the trade corridor will result in upgrades to the dikes. "To say the dikes will never be improved — I think over time, they will. But it may not be part of the outcome we get out of this study," he said. Meanwhile, Bekkers notes that maintenance is ongoing and solutions for existing dikes continue. For example, a damaged portion of the dike near where Atkinson stood was being rerouted to tie in with higher ground and create more shallow lands in front — known as foreshore — that will absorb the pounding tides. However, Bekkers acknowledges the risk of a tidal surge remains. "We are working with emergency measures organizations and depending on the storm that comes in, there may have to be warnings that go out," he said. Quite often, Atkinson walks to the shore and notices how the sea tosses up more driftwood than in the past, even as it undermines the giant slabs of rock put in place to protect the dikes. To him, these are nature's signals that the day of reckoning is drawing a little closer. "We're keeping our fingers crossed no storm comes. What else can you do?"